Kumaon, or Kurmanchal of the yore, is a fabulous land of mountains and valleys fit for the Gods, strewn with temples eons old. A land that breathes serene purity with the Himalayas looming large, it is a land designed by Nature to heal the body, mind and soul. Naturally, the land has attracted legends, from Swami Vivekananda, the Beatles and Bob Dylan, and cyber world’s Steve Jobs. And now, AyurVAID to Kalmatia. The most attractive mountain destination in all Indian Himalaya and closest in Uttarakhand to reach from Delhi, this is the ancient land of Kurmanchal, the land of the Kurmavatar (the tortoise incarnation of Lord Vishnu). Kumaon is a veritable slice of Paradise on Earth. A clutch of temples stand in secluded splendour, solitary structures or as a caucus, in deep valleys by gushing streams, on hill crests, or dense forests of these unhampered vistas of the mighty Himalayas. Kumaon is towered over by the most beautiful mountains of the Indian Himalaya and offers a totally natural environment where forests and wildlife have still to unfold their mysteries. With its pure environs, Kumaon is aptly located for practice of Ayurveda and benefit from the ancient processes and procedues, including Panchakarma and other therapies enshrined in it. Being one of the oldest pilgrim routes to holy Mount Kailash and a major trade link to Tibet, local religious customs and ancient traditions are still alive here.Though the origins of the stone edifices are uncertain, they were largely personal acts of piety by royal patrons of the Chand and Katyur dynasties that ruled Kumaon from the second to 17th centuries. A confluence of cultures, Kumaon is home to infinity of architectural and archeological wonders, prehistoric rock art, charming local villages set amongst spectacular valleys and green terraced lands, with Almora as one of its prettiest and cultural capital. Kumaon lies at the feet of the tallest Indian mountains, Nanda Devi 7816m, Kamet 7756m, Chowkhamba 7140m, Trishul 7120m, Mrigthuni 6855m, Nanda Kot 6860m and PanchChuli 6903m, making it the most attractive mountain destination in all Indian Himalaya and closest to reach from Delhi. Pleasing Autumn, pleasant Spring, polished Winter and refreshing Rains – Kumaon Seasons. 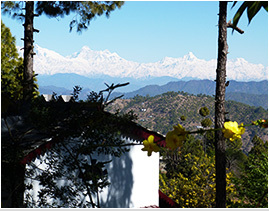 Kumaon or Kurmanchal of the yore, is a fabulous land of mountains and valleys fit for the Gods. The Curious or the Connoisseur, Kumaon encapsule a silent mystery, making you come back for more.